Oxfordshire County Council are running a consultation about the use and satisfaction of Oxfordshire’s countryside and public rights of way. A lot of cycle routes use public rights of way so it is the interest of local cycling to respond to the consultation, which is in the form of an online poll. We wil be joining in the Science Vale Bike to Work day during national Bike Week on Tuesday 19th June. 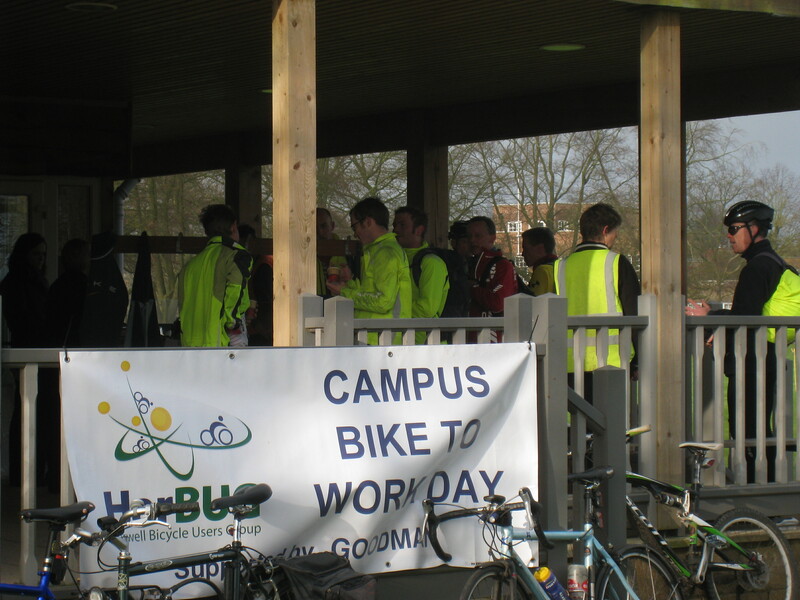 The Bike to Work day is being run in conjunction with Milton Park BUG and Culham BUG. We will be running group rides to the campus from the main towns with a free breakfast, for anybody who cycles to work on the day, which will be served at the Harwell Pavilion from 07:30 to 09:00. The group rides are ideal for cyclists who have never cycled to work before, the pace is relaxed and it gives new cycle commuters the chance to discover the routes and ask questions from experienced cyclists. Abingdon; meet at Old County Hall and depart at 07:45. Harwell cyclists will ride with Milton Park cyclists down to Milton Park and then onto the Harwell Oxford Campus. Didcot; meet at Didcot Parkway and depart at 07:50 (allow for Reading and Oxford trains to arrive). Grove; meet at Millbrook Square and depart at 07:30. Wantage; meet at The Lord Nelson pub and depart at 07:45 with Grove cyclists. If you are cycling in on Bike to Work day but are not joining one of the group rides, please call in at the Harwell Pavilion and say hello. In order to facilitate some works being carried out by RSRL, Sustrans route 44 will be closed along the stretch that runs along the top of the Campus. The closure is from the 14th May 2012 for about 6 months. A diversion has been sign posted which takes you down Curie Avenue. Oxfordshire County Council have asked for a list of our priority cycle projects. Oxfordshire County Council have had their bid for the Sustainable Transport Fund rejected. This is a setback for plans of a Science Vale Cycle Network. The plans have not been scrapped and the council will be seeking alternative funding, however this will most likely mean longer timescales for improvements and new infrastructure. HarBUG intends to keep the plans alive and in the forefront when transport funding is discussed and allocated. In May 2011 Sustrans route 44, which runs from Didcot to Wantage via the Harwell Campus, was upgraded to the West of the Harwell Campus, in the Wantage direction. New drainage pipes have been laid and the route re-surfaced on the stretches that were badly rutted and damaged. HarBUG was instrumental in facilitating the work which was carried out by Oxfordshire Countryside Services. The repairs were jointly funded by Goodman, on behalf of the Harwell Campus, and Oxfordshire Countryside Services. At the same time the Hendred Estate cut back vegetation and overhanging trees and erected new fencing.